The cause of the failure was not revealed, but the test firing of new cryogenic YF-77 engines which power the first stage began in February. The third flight is now expected around November, and will carry the experimental Shijian-20 telecommunications satellite, based on a new, large DFH-5 satellite platform, according to Zhang Hongtai, president of the China Academy of Space Technology (CAST) which develops and manufactures satellites and spacecraft. Zhang told press that the new satellite platform will eventually increase the country’s high-throughput communications capacity to 1 terabit per second, up from the current 20 Gbps with the predecessor DFH-4. Significantly, a successful return-to-flight would pave the way for major missions. The fourth or fifth Long March 5, both due for launch in 2019, would carry the Chang’e-5 lunar sample-return mission, which had been set for November 2017. 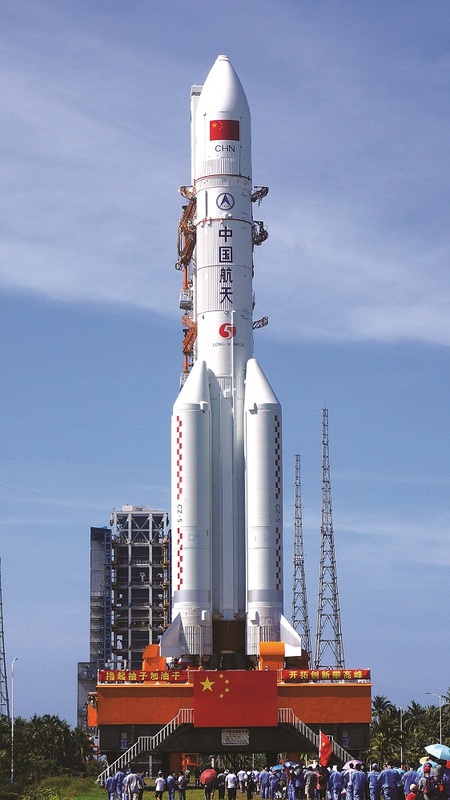 Also depending on a successful launch is the Long March 5B, the version of the rocket designed for lofting the 20-metric-ton modules for the Chinese Space Station. It is expected to have its test flight in June 2019, according to a spokesperson for the China Manned Space Agency (CMSA). Tianhe, the space station core module containing living quarters for China’s astronauts, will be first up into low Earth orbit. Zhou Jianping, chief designer of China’s human spaceflight program and a member of the China’s top political advisory body, said that Tianhe would launch “around 2020,” assuming a nominal Long March 5B test flight. It is to be joined by two science modules by around 2022, and later a co-orbiting Hubble-class “optical module,” which could dock for maintenance and repairs. Joan Johnson-Freese, a professor of national security affairs at the Naval War College in Newport, Rhode Island, expressing her personal views, stressed that the Chinese will not be too concerned with delays or timetables, and will be content with steady progress. The CMSA also revealed that the Long March 5B launch will carry into low Earth orbit a payload which signifies China’s ambitions to move beyond that realm. Aboard will be an early test of one of two versions of a new-generation crewed spacecraft, a large successor to the Shenzhou and designed for human lunar landings and potential deep space missions, including to near-Earth asteroids and Mars. The completion of a prototype of a 500-ton-thrust kerolox rocket engine is expected this year, to be used for a planned Saturn 5-class launcher, the Long March 9, which is planned to fly for the first time in 2030 and to be used as part of crewed missions to the moon and a robotic Mars sample return. The Chang’e-4 lunar lander and rover spacecraft which will attempt the first-ever soft landing on the far side of the moon in November or December, is now undergoing thermal vacuum tests according to Zhao Xiaojin, a senior official at CAST. The pioneering mission, which will aim to set down in the South Pole-Aitken Basin, first requires a communications-relay satellite, to launch in May or June, to be placed in a halo orbit at the second Earth-Moon Lagrange point. Wu Ji, former director of China’s growing space science efforts and a newly appointed member of the consultative body of the national parliament, stated that this first launch will also carry two microsatellites for trialing very-long-baseline interferometry. Wu Weiren, chief designer of China’s lunar exploration program, spoke of expanding robotic missions to the moon. “As only the moon’s south pole can get the sunlight in most of its area throughout the year, we want to land at such a place where there might be abundant sunshine and possibly water to build a research station,” Wu said. The vision, which has not yet been approved by the government, includes three to four missions to the lunar poles in the early and mid-2020s, focusing on technology verification and in-situ resource utilization. Preparations for China’s first independent interplanetary mission, planned for launch in the summer 2020 Hohmann transfer window, are also progressing. Zhou Weijiang, a researcher with the China Aerospace Science and Technology Corporation (CASC), the state-owned main contractor for the space program, told Chinese newspaper Science and Technology Daily that tests simulating Mars atmospheric entry, descent and landing had begun early this year. This year’s parliamentary sessions were the first of a new five-year cycle and saw a freshly selected national legislative body. While a new cabinet and a reorganization of ministries and government bodies were announced, the changes did not touch the space industry. Reform is expected in the future, given the expansion of China’s space program in recent years, and factors such as the 2014 decision to allow private capital into the space sector and an ongoing civil-military integration campaign. The China National Space Administration (CNSA), a small figurehead for international engagement rather than a true space agency, remains without a permanent leader after the previous appointee was promoted to governor of Fujian province early in 2018. John Sheldon, co-founder of ThorGroup GmbH, a strategic space and cyberspace consultancy based in Switzerland, and publisher of SpaceWatch.Global, says the parliamentary sessions are likely not as important as the five year plans and Communist Party of China (CPC) central committee decision making in terms of space policy, budgets, and strategic priorities. 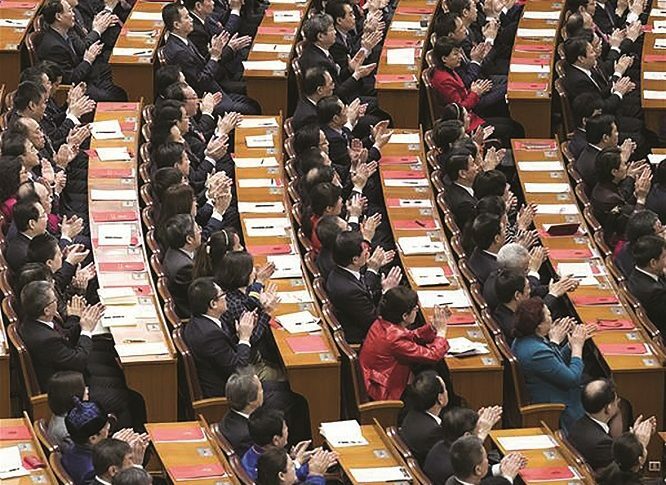 “They are useful, however, in terms of garnering popular support for the CPC and its agenda, as well as sending signals domestically and abroad,” Sheldon notes. Both CASC and the China Aerospace Science and Industry Corporation (CASIC), a defense contractor, state they are developing reusable spaceplanes, but offered no new details and only vague timelines. Initially using combined propulsion for suborbital flights, the groups say they are planning to solve the immense challenges of single-stage-to-orbit by around 2030. Such announcements could, “suggest to Chinese citizens a strong China that is on par with, if not superior, to great powers like the U.S. and Russia, thus demonstrating the validity of CPC rule,” Sheldon adds. No mention was made of Tiangong-1, the country’s first space lab, launched in 2011 but now doomed to make an uncontrolled atmospheric reentry around the end of the month, according to a March 21 estimate from the European Space Agency’s Space Debris Office. Both the leadership of the CPC and the aerospace community will have been glad that the reentry – which has drawn international attention as well as hyperbole — did not occur during its showpiece political event.